The 15 minutes you take to make this scrumptious flatbread will be well spent, I promise. It's so so good. 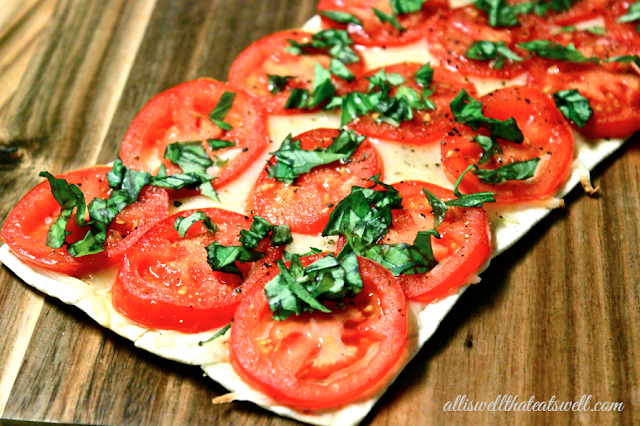 Perfect for a quick bite or when entertaining, I've found that no one can resist a simply delicious flatbread! 1. Pre-heat oven to 350 degrees. Once ready, heat flatbread for about 4 minutes and remove. 2. Take the warm, kind of crispy flatbread and delish up with cheese, sliced tomatoes and a drizzle of extra virgin olive oil (in that order) and place back in oven for about 6 minutes. 3. Remove and garnish with fresh basil, salt and pepper. PS- For a garlicky twist, add a few shakes of granulated garlic over the tomatoes before baking in the oven!